Today, as Tony Hall announced yesterday, we release an early Beta version of a new online music product called BBC Playlister. 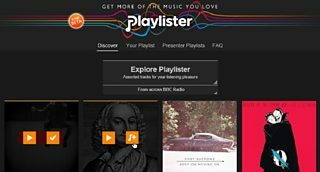 The vision for BBC Playlister is to start to transform music on BBC online, by connecting the music you hear on the BBC with your online music life, helping you to discover more music you love from the millions of tracks that are now so easily available. BBC Playlister will do this by offering three main features. Firstly, BBC Playlister aims to solve the problem of hearing music on the radio or on TV and not knowing what it is, and how to remember it for later. From today, whenever we play music on our national music radio stations and some TV programmes, you will be able to simply “Add” that piece of music to your own personal playlist with one click. And then you can retrieve your playlist from anywhere, at home or at work, using your BBC iD to share this information across desktop, tablet and mobile. Secondly, great music recommendations. The problem many users face today is not getting access to music, but discovering the right kind of music that suits their taste. BBC Playlister aims to translate our expert musical guidance from on-air, to online. See Ben Chapman’s blog post for more on this. Being able to see what our presenters are personally recommending and following them for regular updates is coming in a future product release (see a taster video below), so today we have a simple offer focussing on recently played music and on popular tracks. Lastly, the ability to actually listen to the music you have “saved” or been recommended. The BBC doesn’t own the rights to allow you to listen in full to commercial music on-demand, so we are initially partnering with three of the biggest players in the digital music space: Spotify, Deezer and You Tube. With Spotify we are also releasing a branded Playlister space which houses not just your exported tracks, but also editorially curated playlists from our radio and TV stations. This means you will be able to remember music you’ve heard on the BBC by adding it to a playlist, then “export” or send that information to one of our partners so you can listen in full to the music there. There has been lots of background work necessary to deliver Playlister. We’ve had to rebuild our entire music backend and content management system that delivers much of the underlying data that drives Playlister; we’ve had to create new unique identifiers for individual tracks to allow us to offer aggregations such as “Popular” and to share track resources such as images and short sound clips. We’ve also had to improve the technical architecture of our music metadata ingest systems so that recently played tracks are quickly available for users to add to BBC Playlister. Playlister is labelled a “Trial Beta” for now whilst we gather feedback from users, ensure the technology is robust and resilient enough, and we complete the initial feature set including recommendations from our on-air presenters. Later this year we expect to remove the Beta label, which is also when we’ll integrate Playlister functionality into our BBC iPlayer Radio mobile apps. I’m keen to hear your thoughts once you have used the service, so either leave a comment below or email us direct at bbcplaylister@bbc.co.uk or tweet us @bbcplaylister.